A design landmark in the heart of Essendon. Our clients were young, successful and looking to provide an engaging environment for their children with a contemporary aesthetic shaping the design. The brief comprised of an interconnection between indoor and outdoor living which expanded views to the adjoining parklands. Most importantly, the couple wanted a design that differentiated themselves from the vernacular to express their ambitious identity. To maximise outdoor space on the block’s limited footprint, an inverted mass was created, utilising undercroft scape for outdoor activities. A connection to nature and the nearby parkland was achieved though the designs spatial layout, offering transparency and negative space to seamlessly connect to the outdoors. Views through the home and expansive vertical circulation was also crucial to proving an expanding interior. Externally, the homes efficient cantilevered concrete structure extends beyond entertaining spaces and frames each element of the home. Raw textures were incorporated to express a connection to the homes natural surroundings. Upon entry, the home appears part of a singular landscape. Thanks to collaboration with our landscape architect, a series of floating concrete planes and lush planting provides a seamless transition to the home immersed in nature. 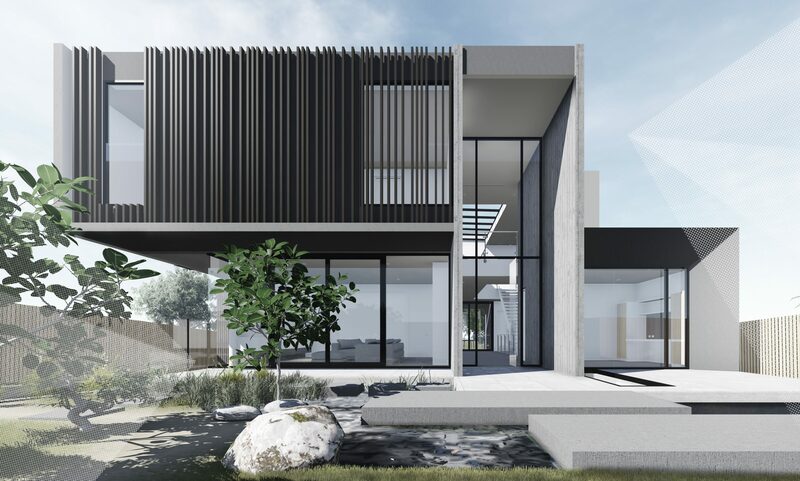 The design features four bedrooms each with connecting ensuites on the first floor, and multiple living spaces which open to a dedicated outdoor area. A large bbq pavilion to the north connects the homes living, dining and entertaining spaces to a large pool and spa. The home facilitates parking for 6 cars, gym facilities with viewing into the pool and a workshop and playroom with a glass roof to the homes entry.